Two of South London's great regular charity book sales coming up in next few weeks. Amnesty International's Blackheath summer booksale is on Saturday 21st June at the Church of the Ascension, Dartmouth Row SE10 8BF from 9 am to 5 pm. 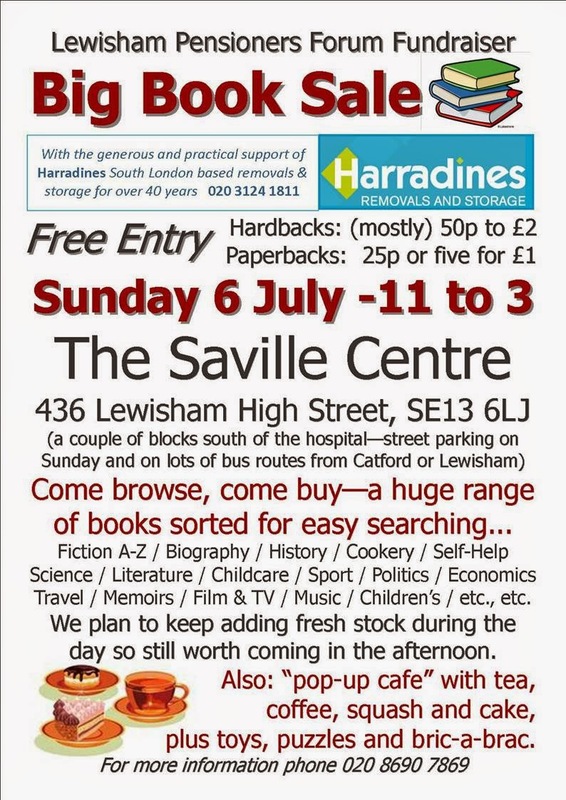 A couple of weeks later on Sunday July 6th, Lewisham Pensioners Forum have their six monthly Big Book Sale at the Saville Centre, 436 Lewisham High Street, SE13 (by Lewisham Hospital) - free entry, prices from 20p for paperbacks and 50p-£2 (mostly) hardbacks. Plus tea and cakes. If you can't find some decent summer holiday reading at either of these, you might as well as give up. We've begun the massive task of sorting these thousands of books. Admittedly there is a deal of rubbish - so many copies of the Da Vinci code that we've (horror of horrors, throwing books away) decided to put nine of them into recyc. - but there are other real gems - particularly in our three or four boxes of "vintage fiction" (basically old orange penguins and anything pre-1950s) and a similar number of boxes just classified "foreign language", (including half-leather bound copies of Proust and Harry Potter in what looks like it might be Korean). Then - for the summer season - travel guides and air-plane/beach reading galore. Please be there. We need buyers. And spread the word by whatever means possible. •some poetry, drama and lit. crit. •a couple of boxes of teenage/young adults paperbacks. Anyone interested can come by the Saville Centre (a couple of blocks south of the Hospital) to check them out. Just please phone (020 8690 7869) first to make an appointment and to ensure that someone will be in. And (within reason) I will consider delivery. Free to a good home (any home) but donations would be accepted - the original events from which they are left over were fundraisers and Lewisham Pensioners Forum is a local charity.